Pastor Raises Money To Buy Out Liquor Stores Near Reservation For a small population, Whiteclay, Neb., sells a lot of beer, mostly to the nearby Pine Ridge Reservation. But now, as the liquor stores look to sell, a pastor is trying to buy them out. 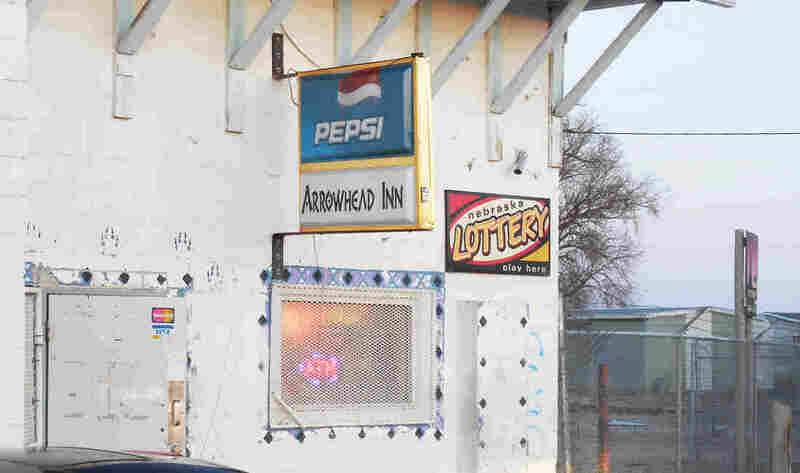 The Arrowhead Inn is one of four Whiteclay, Neb., stores that sell 4 million cans of beer annually. The stores are currently up for sale. The town of Whiteclay, Neb., has a population of 14 people. Its four liquor stores sell 4 million cans of beer each year, mostly to residents of the Pine Ridge Reservation, which is officially dry and right across the state line. The effort to close the Whiteclay stores has spanned decades. But there's an assault on two fronts, including one from a minister who's looking to buy the stores. Pastor Bruce BonFleur is one of a dozen people who were appointed to the Whiteclay Task Force a year ago by Nebraska Gov. Pete Ricketts. Their goal was to find solutions to the long simmering conflict. "It was about midway through that last year that at one of those meetings," he says, "one of the beer store owners in frustration just kind of blurted out, 'We just need to sell. I need to sell. Get out!' "
Those comments echoed by all the store owners reflected frustration from years of protest over the sale of alcohol to tribal members. "So when he said that, I said that to him, 'Well, if that really becomes the situation that you're serious about, come see me,' " BonFleur says. " 'I don't have any money bags attached to me, but we do have some contacts with foundations and other groups of people.' About four months later, one of the beer store owners representing all four drove into our driveway at our house in Whiteclay and said 'Hey, the guys have got together, and we want to sell.' "
So BonFleur formed a non-profit and went to work trying to raise the capital. His goal is to close the stores while helping the Oglala Sioux Tribe and revitalizing the tiny town of Whiteclay. The store owners confirmed that effort, but citing concerns over the sale, none agreed to go on record for this story. The price they gave BonFleur was $6.3 million. "We hope that the good people of Nebraska and whoever else hears this nationwide or worldwide whatever will say this is one way that we can end this — we can end this travesty," he says. Outside State Line Liquor, April Thunder Hawk is just getting in her car. The young Lakota woman is neatly dressed in jeans and a light jacket and is carrying a small paper bag. She says that even though she stops by here regularly, she'd be happy if all the stores closed. "It just looks depressing around here," she says. "It's just horrible. I don't like these four stores, but I still come here." There aren't many other options, even for snacks and soft drinks. But there are plans underway for a better future for Whiteclay. BonFleur says his friend is setting up a warehouse for donated building materials to create mini homes. And Family Dollar has announce a Whiteclay location once the liquor stores are gone. Nebraska State Sen. Tom Brewer is a member of the Oglala tribe and is the first Native American to serve in his state's legislature. He says there are often other factors prompting the store owners to sell. "There is charges right now against all four store owners for bootlegging and the fact that there's been several hundred ambulance calls," he says. "And it just has become a terrible burden." That burden could be lifted on Thursday when the Nebraska Liquor Commission decides whether to renew the stores' licenses. Even if doesn't, lawsuits are likely and sales could continue. So BonFleur will keep trying to raise the millions necessary to buy out the stores and close their businesses once and for all.